What is a club [or turfcare] in any case?……. “It’s a small boy [or girl] clambering up stadium steps for the very first time, gripping his [or her] father’s hand, gawping at that hallowed stretch of turf beneath him [or her] and, without being able to do a thing about it, falling in love” (Sir Bobby Robson). For the forth in the series of my Pro Turf Care blogs I visited a multi-pitch sports complex in Edinburgh. The facilities there are destined to become the best sports performance centre in Scotland. Cast your mind back to your university, college or school days and think about a sports pitch you may have played on. Hold that thought – now imagine what a gold standard sports pitch might look like. Now imagine that standard multiplied within a sports complex for professional team sports men and women. That’s what will be available at Oriam – Scotland’s Sports Performance Centre, in the grounds of Heriot Watt University in its Edinburgh campus. Oriam is due to open in the summer of this year, 2016. I was lucky enough to get a tour of the facilities from Heather MacKinnon (Operations Manager for sports ground care at the University) as it neared the end of its build. I met Heather in the reception of the Sport & Exercise Centre at the University. 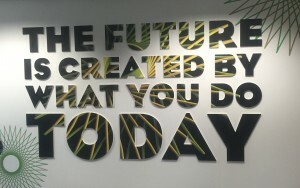 An inspiring motivational message greets everyone as they go through the turnstiles to enter the facilities, ‘The Future Is Created By What You Do Today’. I like that – it’s about investment now, for gain tomorrow. This motto for life could also be applied to turfcare (if, that is, you happen to be a turfcare fanatic like me). Heather chatted with me about her background in turfcare. She had began her grounds care career at Murrayfield Stadium, the home of Scottish Rugby Union, and had been a member of the grounds staff at Herriot Watt University for the past 12 years. We made our way outdoors and I could see sports pitches as far as my eyes could see. There were at least 4 full size football pitches in the foreground and another 2 rugby pitches in the distance. Surrounding these grounds were a row of trees, very likely marking the perimeter of the University grounds. Trees, and more importantly their fallen leaves, aren’t something most sports stadium grounds staff need to worry about. This however was probably a 1 mile / 3 km length of tree line along the edge of sports turf. Certainly something that would need to be managed, especially in late Autumn. We made our way round to another side of the complex. There before me was a giant half-circle shaped, white coloured structure – a dome. This was to house a full size 3g (artificial turf) indoor football pitch. It hadn’t quite been finished, but I could clearly see the spectator seating in place. Heather said this was to initially hold a capacity of 500 seats, but it was hoped this could be increased in the future if necessary. 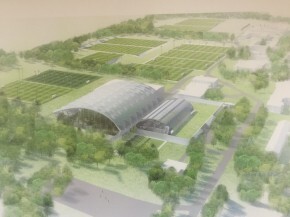 Heather also pointed out what looked like a clear roofed tunnel or walkway linking the sport and exercise centre with the new indoor dome. Teams and individuals could make their way between gymnasium, physiotherapy, science and nutrition, and changing facilities to the playing field without having to set foot outside – ideal in Winter. We then went inside another building next to the dome. This housed two 3g indoor Futsal training pitches (Futsal is a global form of small sided football with an emphasis on ball control and skills). This building was also the home of Heart of Midlothian Football Club (‘Hearts’) training facilities. It was at this point I commented on the sheer size of these facilities. Heather said, we haven’t finished yet, there were two more pitches to show me and we headed back outside. The final two pitches were full size football pitches used by Hearts, university students and community users. One was grass and the other was 3g. Heather explained that the grass pitch is to be moved 4 metres or so to the left so that a barrier can be placed between it and the 3g pitch, and the grass pitch was also to be reconstructed to Stadium quality. Heather chatted to me about pitch management. She explained that access to professional playing surfaces needs to be managed. It’s just not possible, for example, to train 3 days each week in the middle of Winter on a grass pitch that is saturated with rain. Doing so is only going to rapidly deteriorate the playing surface, and when it needs to be used for a match it’s certainly not going to be at its best. Heather went on to say that it’s not about denying access to people’s preferred playing surface – it’s simply about knowing where, when, for what and for how long the grass match-day pitch is being used. This gives Heather and her team of grounds staff the ability to manage and care for the pitch, and to provide the users of that pitch with the best possible surface to play on. This was one of those lightbulb moments for me. Not only have grounds staff got to be skilled at managing their playing surfaces, I believe they also need to be skilled at managing people too. I have never toured a facility with so many sports pitches. It’s quite remarkable that Heather and her team of only 3 other permanent grounds staff (albeit with input from contractors when necessary) care for such a big area of grass and 3g surfaces. Not only that, the amount of people using the facilities is greater than I imagined, and requires people management skills as well as turfcare management skills. It is this combination of management skills that I will take away most from my visit. The purpose of my Pro-Turf Care series of blogs is, among other things, to tackle the narrow view that turfcare is just about cutting grass. Heather and the sports pitch facilities she manages is a clear example of how important it is to have a wider set of skills. Turfcare and turf management is also about people care and people management. The grounds staff and the sports players both want a great playing surface, and good management and teamwork helps them achieve this. This is certainly something I’ll take away from my visit and pass on to others considering a career in turfcare. All that remains is for me to thank Heather for her kind hospitality and time, and for sharing some of her knowledge and experience with me. Opportunities to visit people like Heather and places like Oriam should be fun, but for me they should also be about learning. Thank you, Heather, for a fun visit, and for helping me learn. Please keep an eye out in the press regarding the official opening of Oriam in the summer of 2016. I for one am already looking forward to a return visit.